Since its inception, cinema has always operated on a set of rules. When cinema was new, moving the camera was something of an innovation. In the first years, people didn’t think to move it, not to mention how difficult such a thing turned out to be. F.W. Murnau had a camera strapped to cinematographer Karl Freund while riding a bike to capture a famous moving shot in The Last Laugh, as an example. At the time it was called ‘entfesselte Kamera’, or ‘unchained camera’. In today’s world, cameras are becoming smaller and more portable, and various equipment exists to ease this process. Mobile cinematography has become the norm. Indeed, not moving the camera is often considered static, inert, or otherwise uninspired. But some filmmakers have always resisted this impulse, prime among them Yasijiro Ozu, whose camera moves a handful of times across a career that spanned over three decades. Instead, he preferred textured compositions that imply depth, and often cut to close-ups to create a sense of momentum through editing. He would also insert so-called ‘pillow-shots’ between certain sections, either to cover an ellipsis or represent a temporal jump. These shots – typically beautiful – make up for any supposed inertia a still camera might imply. Meanwhile, the stillness invites a contemplative atmosphere, a calm totally suiting the quiet crises so common among Ozu’s characters. Content meeting form. During the peak of Hollywood’s studio system, sets were the way movies were made. If you needed a room, a park, a castle, they’d build it on the lot and shoot as much of the film as possible on home turf. By the 60s, this idea was becoming antiquated even in Hollywood, and more often real locations were prioritised for their realism, their scope, and their unique detail. This also allowed for a different kind of filmmaking, where the camera could explore a location as opposed to a location being built for the camera. But Roy Andersson, a contemporary Swedish director, still recognises the affordances of a custom built set. His films are rarely set in outlandish locales – indeed, most find themselves in drab and depressing rooms and buildings. But nonetheless, he has all of them built, including the exteriors, so as to allow him total artistic control over these spaces. More than using buildings to stand in for his imagination, he is directly replicating these ideas through craft. Lighting, colour, and scale then become tools in his arsenal, where a real location might demand he bend to its own specificities. One of the basic rules of screenwriting is economy. Any wasted time or wasted pages will become wasted screentime; a film loses its urgency if it lingers, and threatens the patience of its audience if it dawdles on nothing. This is why some screenplays can come down from mammoth page counts without changing their inherent nature – there is typically a lot of fat on the bone. And more than that, editing should sharpen even these remnants, reducing deadtime and avoiding awkward gawping before an actor delivers their line. Awkward gawping is, however, the name of David Lynch’s game. 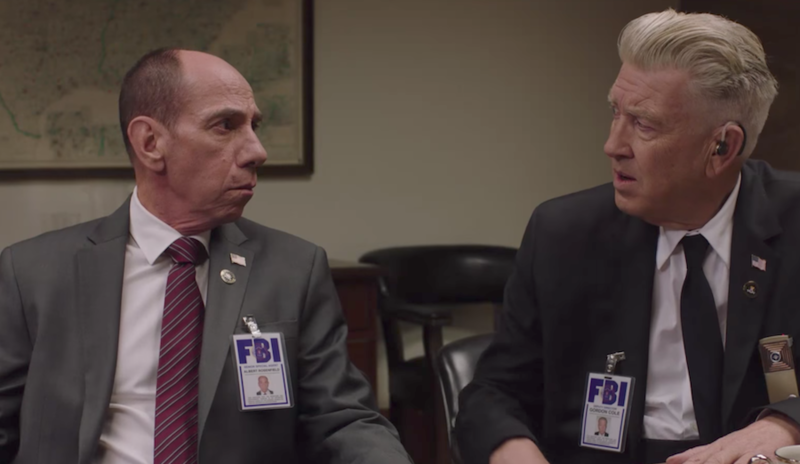 Lynch has no trouble drawing out his conversations, their performances, and the way in which they are edited, as best shown in the most recent season of Twin Peaks. One scene has Gordon and Albert talk at such a plaintive pace as for the camera to cycle a full shot/reverse shot twice without either one saying a word. This happens several times. But rather than being unbearably boring, Lynch leverages this empty tension to create something like a ‘domestic unsettlement’. Many of his settings and characters are inherently familiar, and yet always bizarre in their mundanity. Lynch is consciously subverting the cinematic norm, and using its effect to his advantage. The skeleton of any good film is a good script. And while a good script can never guarantee a film will be good, a bad script always guarantees that a film will be bad. It’s a fundamental and essential part of the filmmaking process, through which ideas can become concrete before shooting. But more than a version of the story, it’s also an essential tool for organisation. Shot lists, casting, and editing will all refer back to that all-important document. Without a script, you’ve got no film. Unless, of course, you do. Gasper Noe’s most recent film, Climax, did without a script entirely. Instead, his cast (all but one non-professional) referred to a single-page outline and improvised extensively. The film was also shot chronologically in order to engender a sense of genuine progression for the dancers (normally unusual in filmmaking). As such, the project comes together as a cumulative and cooperative process between the various filmmakers. This process was intended to match the nature of the story itself, whereby a certain experience is corporeally and expressively communicated through dance. A bold move, to be sure, and an effective one. A more or less universal rule in filmmaking is, when playing a film, for the footage to run forward. And I’m not talking Memento here. I literally mean making sure the reel is moving in the right direction when you’re editing. This isn’t much of an issue with digital technology, and even without, I’m not sure it’s ever caught anyone out. It’s usually fairly obvious when a film is running in reverse, and an easy fix if not. Enter Oldřich Lipský, a filmmaker of the Czech New Wave who was perhaps the cheekiest of that famously cheeky moment in cinema. His 1966 film Happy End breaks this unbreakable rule. It begins at the end and plays, in reverse, all the way to the beginning. It starts with his death (described as his birth), and ends with his birth (a particularly discomfiting death, apparently). The story – as narrated in reverse – takes a totally different passage to how it might appear played forward. For example, he marries his wife by assembling her from various parts. In forward motion, he cuts her up after finding she was having an affair. Little differences like that. As might be expected, the result of this rejig is inspired and hilarious. And an example that no rule is too essential to break.